In this post I wanted to shine a spotlight on two very seasonal wild greens. Sharing my favourite recipes, ways to identify etc. This is going to be a regular series on my Nature & Nourish podcast as well as here on the blog, with each month bringing a focus on another beautiful wild edible or herb. My first experience with wild garlic was on regular childhood walks in Avondale forest in County Wicklow. During spring the forest floors would be carpeted with the glossy long leaves and the smell of strong garlic would herald a new season! As for three cornered leek I became acquintated with this wild green later on, when I moved to my husbands farm and came across bunches of it nestled by the river. Although it looks similar to wild garlic is has a more gentle flavour and works well as a spring onion or chive substitute when there’s little else growing in the veg and herb bed. I find three cornered leek is much in the shadows of Wild Garlic, which has become the entry plant for most foragers and beloved by almost everyone. I wonder if it’s generous abundance after a long winter of little growth that really sparks it’s appeal? Or maybe it’s un-mistakable scent that makes it a safe plant for everyone to forage. It’s also delicious and simple to use which just adds to it’s popularity. But first lets talk a bit about what wild garlic looks like and where you can find it! 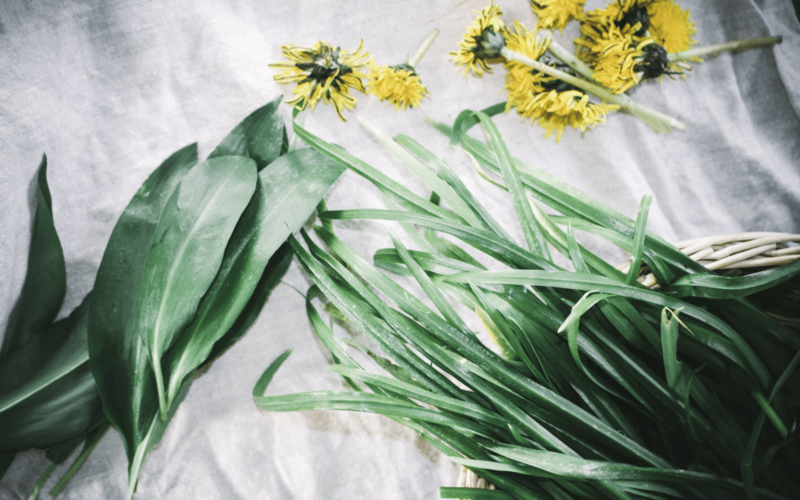 Wild Garlic, sometimes called Ramsons belongs to the Lily Family, Liliaceaeand more specifically the allium genus which brings us our beloved onions, leeks and garlic but also these wild varieties which arrive during a particular sparse time in the growing calendar. Depending on your location Wild Garlic, or Allium Ursinum, will begin to show in late February and finishes in April. It definitely prefers wooded areas so you are most likely to stumble across it in an old woodland or around the edges of one. If you don’t have any wild garlic in your locality you can actually grow it very successful, you’ll just need to find a shaded spot under some trees and you should find it takes well. Wild garlic appears as tapered shoots, slicing through the soil in late winter and early spring with broad glossy leaves, eventually up to 25cm long and tapered at both ends. It tends to grow en masse, an ample crop for sure and will fill the air with that raw garlic scent. The leaves are glossy, broad in the centre and once torn will omit a garlic scent, making this an easily identified plant. Although of course bring a proper guide book with you and never consume if you’re in any doubt. Wild garlic will also produce clusters of white flowers with six long petals each, these are also garlic-y and tasty strewn over salads. The bulbs of the wild garlic can be eaten also, but make sure you don’t over harvest them or clear an area, Wild Garlic will divide and seed but still be frugal in your pickings! Ideally harvest wild garlic using scissors and use the foragers rules (see blog post). If an area has only a few plants growing leave them to establish for a few more years before harvesting. Just like garlic Wild Garlic has health benefits too! It’s a natural prebiotic, aiding good digestion and it’s milder taste could convert garlic haters! As for recipes there is a multitude of things to do with wild garlic. As it has a nice soft leaf it works well shredded into salads but of course it is delicious in a wild green pesto! Just substitute basil with a handful of wild garlic and use it like typical pesto. I also like to infuse it in olive oil, dry it and use it as a seasoning, chop and mix it through fresh butter, combine it in mayo, toss through risottos, fold leaves through omelettes…basically anyway you might use garlic and even spinach! Although it is worth mentioning that the longer you cook Wild Garlic the more the flavour will subside so keep cooking times short! Three cornered leek or Allium Triquetrum, isn’t as prolific as Wild Garlic but funnily enough we have more of it than the latter here at the farm. It’s a clear relation to wild garlic and can confuse many but has a far milder flavour and skinnier leaves. It enjoys growing on field edges, banks, verges, and waste ground as well as open woodland. Like it’s name suggests the Three Cornerned Leek has triangular shaped leaves and actually looks quite similar to a bluebell although its flowers are white and unlike bluebell it is safe to eat. The flowers also have a green thin stripe running down each petal which is a nice identification tool to have at hand. Of course the real distinctive factor for three cornered leek is its smell. Not as strong as wild garlic, it has a chive like smell, mildly garlic-y. If you pull up one it has a little bulb that can be used like onions or pickled but again be frugal in your pickings. You can use Three Cornered Leek in a similar way to Wild Garlic but with less of a garlic punch. It’s really delicious in omlettes, quiches and also fresh in salads. It also tastes wonderful teamed with wild garlic in a wild green pesto. PS you can listen to this post on my podcast below!